For all makes of new construction freeform pools, this application allows you to have a shaped pool while having the options, features and benefits of the Undertrack system above. This is the standard lid that comes with all undertrack systems. Much like a car hood, this lid allows easy access to the mechanism underneath. This lid is NOT intended to be walked on. Using the standard aluminum lid on the left, we send it to our powder coater to have a baked on paint finish applied to it. We stock 6 standard colors that have been our most popular choices throughout the years. Specialty colors are available. This application matches whatever material the pool coping is. We mount the material on heavy duty brackets and in some cases stainless steel trays to support concrete, bricks, natural stones, pavers or wood. We design each job so we can access the system in the future by making them in manageable sections. Contact Pool Cover Solutions today for a free estimate. Beautiful and functional-see for yourself why pool builders are incorporating automatic pool covers from Pool Cover Solutions in the newest Charleston Home & Design. 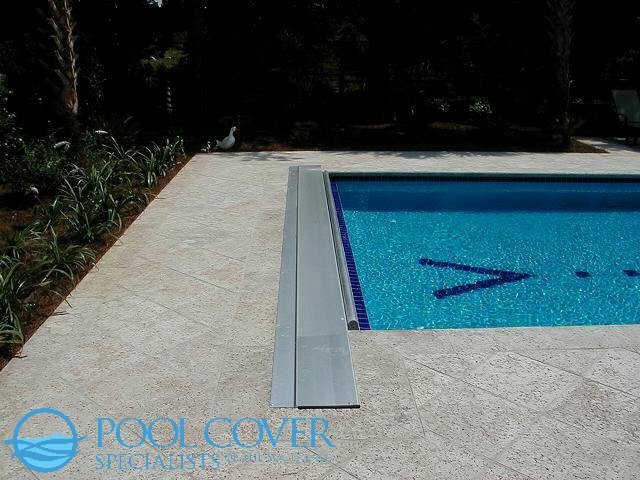 Pool Cover Solutions of the Southeast, LLC is a specialized company serving the needs of homeowners and pool builders with the best safety pool products available. PCS-SE is a family owned company based out of Charleston, SC serving SC, NC and Coastal Georgia.